New Vitality Ruby Reds is a berry superfood drink that is super affordable and offers a decent value. I don’t love the taste and I do find the label to be a bit confusing, bringing down my overall rating in this New Vitality Ruby Reds review. If you are looking for budget superfood drinks, this review is worth reading. Otherwise, skip out and check out my other top berry superfood drinks. Based in Long Island, New York, New Vitalities is a trusted manufacturer of various superfood and skin health products. New Vitality Ruby Reds ingredients are comprehensive, extensive, and every other possible “ive” word that comes to mind. Solid diversity, micro-ingredient disclosure, enzymes and probiotics, all careem this less known berry superfood drink into the same stratosphere as many of our top berry superfood drinks. 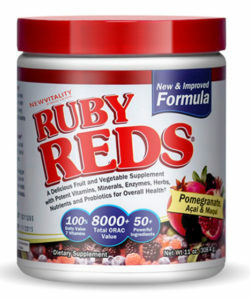 Ruby Reds starts off ambitiously citing a huge number of vitamins in their formula. You get 250 mg of vitamin C in terms of what’s notable. That’s not bad for one serving of a drink. The rest of the vitamins and minerals present are in lower volume, however, that’s not always a bad thing. More isn’t always better when it comes to vitamins. For example, you get 2 mg of zinc, which sounds small, however, lots of people experience side effects from too much zinc, particularly when there is a lack of copper (which happens to be the case in Ruby Reds). The oxy blend is where a lot of the magic happens in Ruby Reds ingredients. You get Green Tea, Quercetin, Blueberry, Cranberry, Pomegranate, Raspberry, Strawberry, Brocolli stems and florettes, Carrot Roots, Collard Greens, Resveratrol, Spinach, Tomato. Wait, did a berry superfood drink just slip some collard greens into its formula? Indeed, Ruby Reds most certainly did, and that’s a wonderful thing. Loaded with vitamins C, K, E, A and calcium, the rarely discussed collard green is a potent superfood. Most people don’t love cooking them because they are tricky. Many people pass them by in the grocery store because they simply don’t understand what they are. And well, some people hate the taste. You don’t have to worry about the taste of them, they are submerged in a number of great tasting berries. Another green that’s present is spinach, which clearly, is a renowned superfood leafy green that’s loaded with iron, among other things. Strawberries will be your big source of vitamin C in this formula. Blueberries, pomegranates, and cranberries are a load of antioxidants. The addition of broccoli is pretty nice. Here’s the bad news, the formula is only 400 mg. The overall serving sizes of Ruby Reds is, however, high. The point being, the actual berry blend is low, especially considering the berries in the oxy blend are flanked by greens. You can’t really see how much of each ingredient you are getting, either. To ramp up serving sizes, a number of powders were also included: Apple, Strawberry, Cranberry, Papaya, Mango, Watermelon, Peach, Orange, Beet Root, Stevia. These range between 179 mg to a more robust 350 mg. There is a probiotic and enzyme blend. While it’s always nice to include gut health benefits in a superfood formula, there are only 150 mg probiotics and 125 mg in enzymes. That’s skinny, to say the least. Nice addition, but not really a ton of it to speak of. The New Vitality Ruby Reds Supplement Facts are shown below. I saw some containers being sold on Amazon for under $25. The New Vitality site’s product offer seemed to not work, not sure why? All the same, you get 30 days worth of Ruby Reds for roughly $25. Each serving being a shade over 10 grams, that amounts to 80 cent servings. That’s a good daily price, but the formula is a bit all over the place and I can’t tell what you get the most of. I didn’t love the taste, all things considered. I was expecting sweeter considering that they use both stevia and sugar in the ingredients. It works well in yogurt for me, but I think you could do better in this area. It’s a superfood driven formula that has a lot of antioxidant fuel for the body. You do get some gut health aspects, however, not a ton. Its cheap and has a good serving size. There are lots of vitamins and minerals. The manufacturer is trustworthy. Um, its a cheap drink (works both ways, really). The label is confusing as to how much of what ingredient is contained. There added sugar. It also uses soy for those people wanting to avoid such things. The probiotic and enzyme formulas are weak. It’s a budget drink. New Vitality Ruby Reds is one of the rare superfood drinks that you can find for under $25. That said, they scale down the quality of the product to achieve such a crazy low cost. If this is all you can afford right now, go for it.